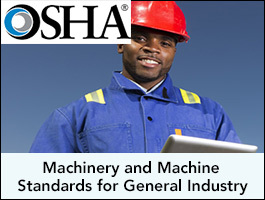 This course covers the various types of common machinery, machine safe guards, and related OSHA regulations and procedures. Guidance is provided on the hazards associated with various types of machinery and the determination of proper machine safe guards. Course topics include machinery processes, mechanical motions, points of operation, control of hazardous energy sources (lockout/tagout), guarding of portable powered tools, and common OSHA machine guarding violations. Program highlights include the ability to recognize hazards and provide options for control and hazard abatement through machines safeguarding inspection workshops.